The demolition market for older ships is picking up pace as of late. 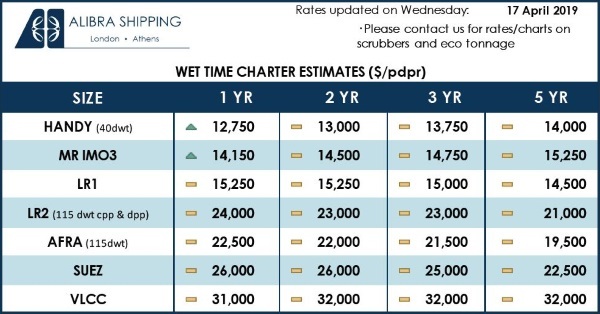 In its latest weekly report, shipbroker Clarkson Platou Hellas said that “since last week’s high profile Container sale, many owners decided to pull the trigger on some of their vintage units, meaning that the market was hit with a wave of new tonnage across all types of vessels. This sparked the market into life after the summer lull and as a result, had initially created a lot of optimism from the cash buyers. However, as is inevitable, this large influx of tonnage has started to rock the boat slightly and some trepidation has crept into their minds, particularly with the Indian rupee further depreciating this week to record lows, meaning the has now resembled a rollercoaster due to the volatility from one day to the next. The end of the week saw only one, maybe two, cash buyers bidding hard for an available unit with the majority happier to wait and see the next direction the market takes this week. Despite caution creeping back into the Indian market, its neighboring counterparts may just help to keep the recent momentum going. Pakistan appears to be somewhat stable after the cutting permissions saga that has lasted the majority of the year, resulting in positive local sentiment locally”, said the shipbroker. “However, as always, when one market shows signs of sliding (India), then generally their competitors follow suit. Indeed, the end users in Pakistan is, reportedly, fearing their own currency devaluation in the next couple of weeks, which would only add further caution in this volatile period. 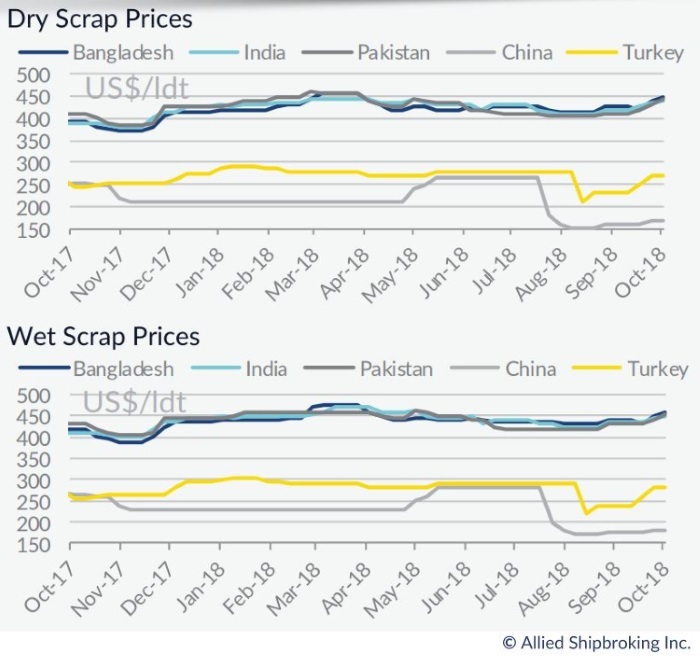 Away from the Indian subcontinent markets, and with Chinese buyers on the verge of disappearing indefinitely from the international recycling market, we do need to keep a close watch on the Turkish market, which offers viable alternatives. This market has improved over the past few weeks and is now showing encouraging signs of levels excess USD 310/ldt. This has come from the mini-crisis of mid-August where the currency lost approximately 50% of its value against the U.S. Dollar in the span of about two days. Things are now slowly returning back to normality, albeit a new pattern, where the currency has stabilized at around 6 Turkish Lira to the U.S. Dollar. Although things seem to have been contained for the time being, there is a widespread concern as to how the economy will react in the medium term, with inflation creeping up and credit becoming more expensive. Therefore, although the markets are currently stable, no one is sure if the measures already taken are sufficient or whether increased action might be needed to help stabilize the economy further”, Clarkson Platou Hellas concluded. In a separate note, Allied Shipbroking noted that “a modest flow of candidates was sent to the breakers these past few days, a big shift in the market when comparing to the typical weekly volume we have been noting of late. Overall there has been a large increase in appetite amongst breakers, with a fair jump being noted in the quoted prices across all of the Indian Sub-Continent. The dry bulk sector continues to make a rather “loud” absence, while much of this “gap” seems to be still covered sufficiently well by tanker units. Moreover, given that we are at the very start of the fourth and final quarter of the year, and with most holding a bullish attitude in terms of earnings, especially for the dry market, it will take ever more efforts on the side of breakers to keep this activity volume going. Notwithstanding this, we have already started to see this being reflected on the pricing front, while with local steel prices still holding strong and most of the previous inventory now processed, it all seems as though the next couple of weeks will see a fair amount of heated competition take place as each looks to outcompete the previous seen price levels and entice the more high spec favorable units circulating the market”. Meanwhile, GMS, the world’s leading cash buyer added that “the Indian currency registered some dramatic declines this week, pushing the envelope well in excess of Rs. 74 against the U.S. Dollar, in addition to some alarming slides in local steel plate prices, both of which ensured it was a terrible week for the Indian market. The declining fundamentals also raised the level of caution amongst Ship Owners and Cash Buyers who were looking to conclude their units into India, especially after the recent blockbuster USD 500/LDT fixture seen here last week. As expected, on the back of the container sale over the magical USD 500/LDT mark (which seemed almost too good to be true at the time), a flurry of vessels have been introduced into the market this week. However, it hardly seems feasible to achieve a repeat of this deal today, given the extreme volatility and turbulence that the Indian market has continued to display on a daily / weekly basis, despite being the favored container destination. 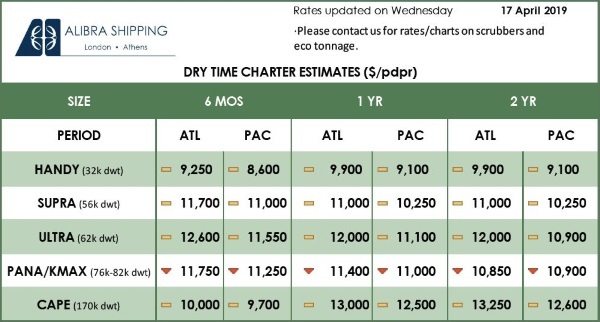 Meanwhile, supply is expected to firm up during the fourth quarter of the year, with the tanker market still in the doldrums and the container market also starting to show signs of fatigue. 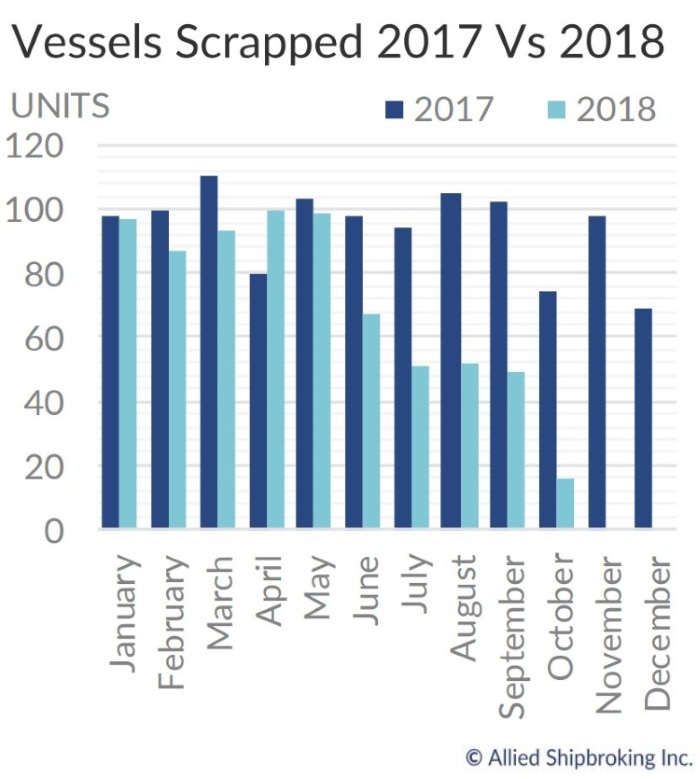 Since few vessels have graced the various subcontinent waterfronts over the summer months, the capacity to absorb this increased flow of tonnage certainly seems to be there. Owners may only have to temper their expectations of receiving offers in the mid-to-high USD 400s/LDT as only one sale at USD 500/LDT has been recorded and this level seems far from achievable at present. 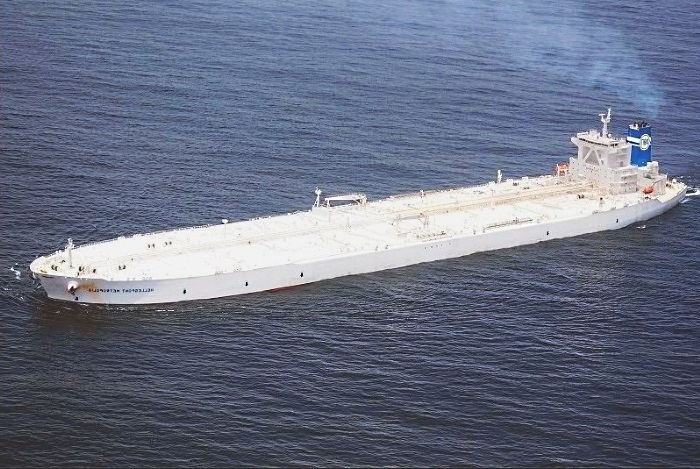 Pakistan looks set to finally return to the action at some decent rates as news of several local VLCC sales from various Cash Buyer hands emerged this week. Moreover, given that there finally is clarity on permissions to cut tankers and there are no new duties imposed via the ‘mini’ budget; expect the Gadani market to be the location to watch in the month(s) ahead. Finally, China remains invisible as Turkey records its own jitters this week”, GMS concluded.